Jean Claude is one of Rwanda's incredible peacemakers. This Compassion alumni forgave the perpetrator who tortured and murdered his family during the 1994 genocide against the Tutsi—and even provided for his son’s education. Warning: This account contains disturbing details of violence. I was born in the country of Rwanda in Kigali City, but I was born in a poor family where getting food was a problem. Where going to school was a problem. To survive was hard. In Rwanda, a child starts nursery school at age three. But for me at three years, there was no hope of school. Four years, no hope. Five years, no hope. But because of God, one day people came to my home from a church. They were seeking children to support. God directed them to my family and they said, “You have a little boy here, bring him tomorrow to Compassion at the church." 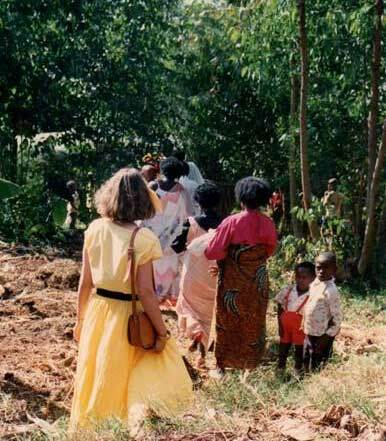 Jean Claude, in the red overalls, was registered at age five in Compassion’s program in Rwanda in 1988. We went to the church, and they took a picture of me. From then, I started to go to school. When I joined the Compassion program at the Methodist church, the first thing I got was to know Jesus. My family did not believe in God. But they taught us stories about Jesus. When I came home, I would share them with my family. The genocide of the Tutsi people happened in Rwanda in 1994. It was terrible. The Hutus killed the Tutsis. But Hutus were not people who came from other countries or from far away. They were our neighbours. They were our friends. It was surprising to see where a husband would kill a wife. Where a wife would kill a husband. Where parents decided to kill their children, saying they were Tutsi because of the background of the spouse. My family were Tutsi. And during the genocide, I saw my dad killed. He was killed very badly. They started by cutting off his arms, cutting off his legs, cutting his eyes. They killed him many times. It would be better if the people only killed him once. But they started with his arms and legs and hitting him with machetes. A group of 12 people came to my house, and I went to hide behind the fence. I saw everything. And also my sister was there. She was killed very badly too. Also, my aunties and uncles were killed because we lived together in the same place. My mother didn’t get killed, but she was beaten. She had trauma from that day. Now she’s living with a mental disability because of everything she has seen. From the genocide until today, she has taken medicine every day. In 1996, our Compassion program at the church reopened and the children who survived came back. ** It was hard. It was hard for the Compassion workers. Before, you had many children, and afterwards, you had few children. You see this one was killed, this one was killed, and this one was killed. Those workers, they had a big, big job. First, they had to comfort us, to encourage us. But it was hard. We were still living with the people who killed our families. Before the genocide, we didn’t think about who was Tutsi and who was Hutu. But when we came back to Compassion, there were Hutu children and we thought, “Oh, maybe this one’s father killed our parents. How can we share Jesus together with them?” But Compassion did a great job to give us hope again. To teach us about forgiveness. They also would give us food and livestock. They gave me a goat. The goats helped us rebuild and restore our family. 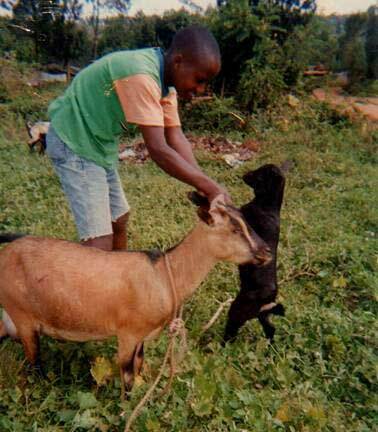 Jean Claude received a goat from Compassion to help his family rebuild after the genocide. But I had one child sponsored in my organisation whose father was in the group that killed my father. They were neighbours. After the genocide, the father was imprisoned for his crime. So when I was selecting children to help, I said, “Bring his orphan. He doesn’t have a father.” That is forgiveness. When Jesus was on the Cross, he had the capacity to say, “Kill them father.” But he said, “Father, forgive them, for they don’t know what they are doing.” That is forgiveness. I love that child of my father’s murderer. 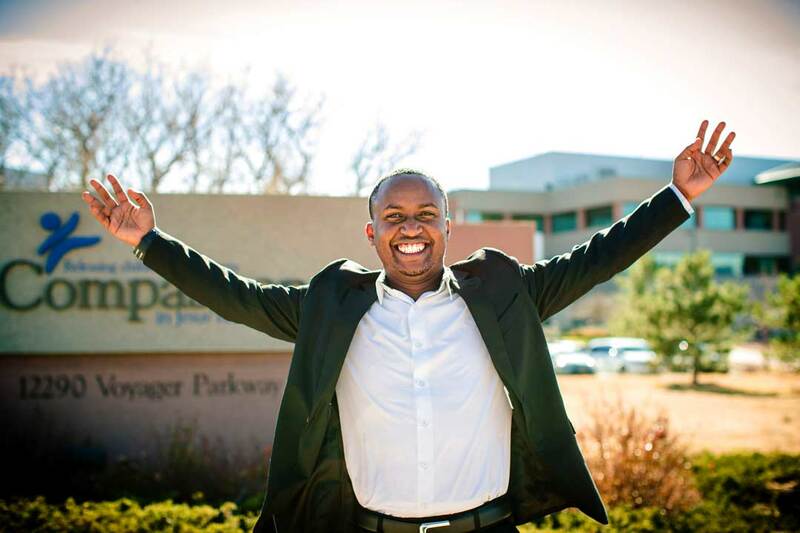 He has been supported since high school, and now he’s attending college. Because of Compassion, I am who I am today. Because of the education they allowed me to get, I grew up with hope and I gained the purpose of rescuing my family from poverty. When I was at school, I studied very hard, and God helped me. I graduated high school with high marks and went to a very good university to study Law. When I graduated, I became an attorney. Now I am the legal advisor for the Compassion Alumni Association in Rwanda. It’s my way to give back. In 2004, because I loved Compassion so much and how they taught me the Bible and how I and my family changed, I collected some orphans together. We taught them about Jesus and we taught them to help each other. We gave them hope and encouragement to work hard. Today I have more than 200 children sponsored in my organization, Best Family Rwanda. This inspiration came from Compassion, because from Compassion I learned to teach love, to teach God, and to teach hope. 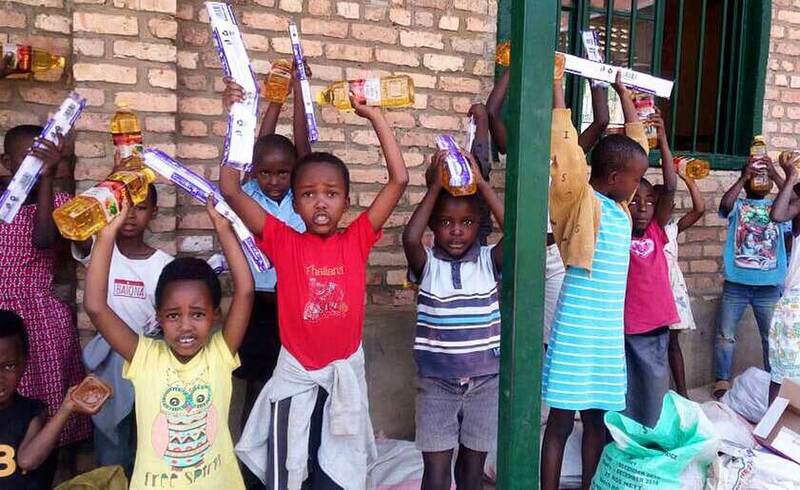 Some of the 200 children being supported holistically through Jean Claude’s organization, Best Family Rwanda. You invested in a seed. It’s something you put under the ground, and it grows up into a tree and begins to have fruit. I can say that I am a seed from Compassion. Jesus taught His disciples, “You learned from me; you spent years with me. Today it’s time for you to go and share the gospel all over the world.” Compassion invested in me, built me up, and today I am going. *Adapted and edited for length and clarity from an interview conducted by Compassion International. ** After the genocide, most churches that partnered with Compassion had to stop operations—so our ministry shifted focus for a time from child development to child rescue, as 300,000 orphans were created in just a matter of days. After two years, Compassion was able to begin holistic child development ministry again.